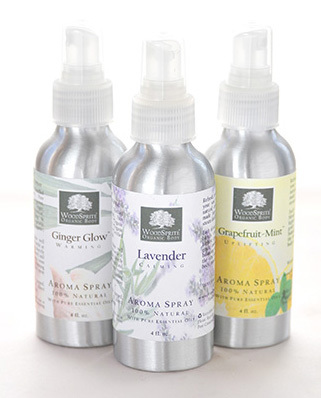 DISCONTINUED--LIMITED QUANTITY AVAILABLE: Refresh, revitalize and restore your soul with our totally natural aromatherapy sprays, made from soothing, pure, steam-distilled essential oils. 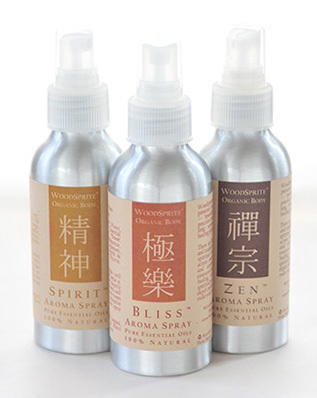 Each of our synergistic aroma blends contains only the highest quality, therapeutic-grade essences to assist in balancing and strengthening the vital connection between body, mind and spirit. To Use: Shake well. 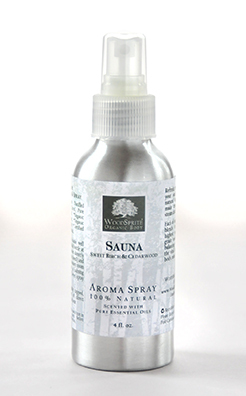 Spray a fine mist over face or body, or use to freshen a musty room, or your car, or your office--anywhere and anytime you need a little aromatherapy boost! Choose among 7 of our most popular original aromatherapy blends, from either our Signature Collection, or the Sacred Collection of rare and precious oils. 4 fl. oz. Packaged in Recyclable Aluminum Sprayer Bottle. $16--$19 each. This spray is so wonderful. Every time I spray it I have a feeling of comfort. It can be sprayed in the air or directly on the body. Can't say enough good things about this product! Thanks WoodSprite. Earn 8 Loyalty Points when you buy this item!